This delicious, tender butter chicken is served slathered in a rich and creamy tomato sauce amped up with Indian spices like garam masala and kasoori methi. 1. In a large bowl, stir together ginger paste, garlic paste, garam masala, lemon juice, chilli powder, turmeric, and a pinch of salt. 2. Stir in chicken, making sure it is completely coated. 3. Cover and refrigerate for 30 minutes. 4. Once chicken has marinated, heat oil in a wok or a flat non-stick pan over medium heat. 5. Add marinated chicken to the pan; stir and cook for about 10 minutes, until chicken starts to brown. 6. Remove the chicken pieces and set aside on a plate. 1. Stir butter into the oil and heat until butter starts to foam. 2. Stir red chili powder into the butter. 3. Stir the tomato puree into the pan. 4. Add honey and salt to the pan and stir well. Bring the mixture to a boil, then reduce heat to low. 5. Add the cream to the pan and stir carefully to create a rich sauce. 6. Add the chicken back into the pan and cook over low heat for about 5 minutes, until the sauce is smooth and thick. 7. Remove from heat and stir in the kasoori methi, garam masala, and chopped green chilies, if desired, to add a little kick. 8. Serve with naan or rice. 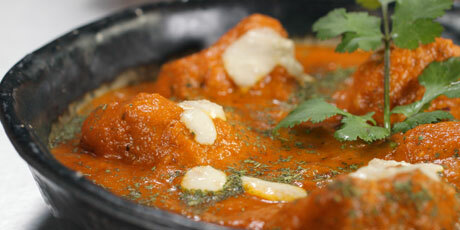 Butter chicken will keep for up to 2 days if covered and refrigerated immediately.